Hulu is set to phase out the Live TV app it introduced earlier this year as it condenses its functions into the subscription service's main iOS app, which has received a new lick of paint in the process (via The Verge). "Heads up! We are saying goodbye to our Hulu with Live TV app so you can have all your TV in one place. 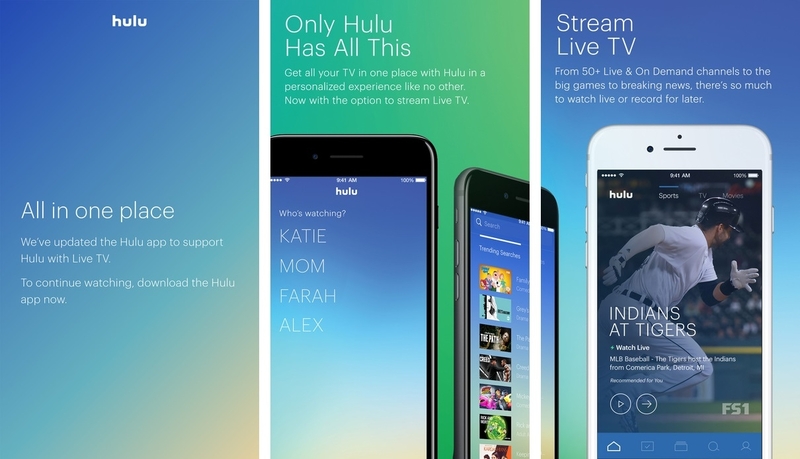 We will soon unify the two Hulu apps currently available in the Apple App Store, Hulu with Live TV and Hulu, into one great on-demand and live TV viewing experience." In an effort to minimize confusion, both the $40-per-month live TV subscription services and the $8-per-month on-demand option will be available in the company's core app. In the meantime, the Hulu with Live TV app now has a splash screen that sends users to the main Hulu app to access its streaming features. The company says it will continue to regularly update the Hulu app's look and feel, as it attempts to address issues users have had with the new interface, which has adopted the green hues of the service's branding. It's not working yet for me. Keep getting an error message that tells me to check my internet connection. Meanwhile, the live tv app version still works perfectly. Then why did Hulu launched at first place with separate app? Poor decision. Happy now it's united. About time. Hopefully they'll support 3rd generation Apple TV.